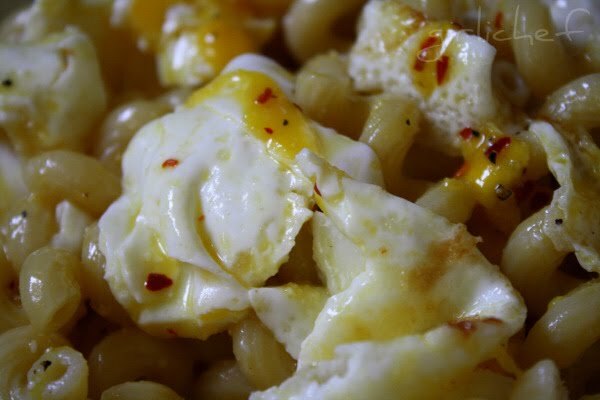 I remember praising the brilliance of scrambling eggs with pasta...so why did I never think of topping pasta with fried eggs? Huh. Slow on the uptake, I guess. Lucky for me I have a little Bitty to help me with things like that. I was broke trying to use up some more pantry items the other day...and came across 2 pasta recipes that I had HAD! to try...so I went ahead and just cooked up a pound of pasta and divided it in half. So there. Nothing holds me back ;). Both of these come from my current fave, Kitchen Express...and ya know, cooking up a pound of pasta two ways didn't actually take that long. While I waited for the water to boil and then the pasta to cook, I was able to whip up the two add-ins and finish everything at the same time. The key was starting the onions caramelizing first thing, cuz that takes a while to do right. Although, the actual recipe didn't actually call for caramelizing come to think of it...it just called for browning. But that deep natural sweetness that comes from that process is just tooooooo amazing not to do it if you have the time (and if you're waiting for a big pot of water to come to a boil and cook up some pasta, you have the time!). Boil salted water for pasta and cook it; meanwhile, fry four eggs in butter, keeping them very runny. Drain the pasta, reserving some of the cooking water, and toss it with a few tablespoons of olive oil or butter, lots of freshly grated Parmesan cheese, salt, pepper, and enough of the reserved water to moisten; top with the fried eggs. Roughly cut the eggs up and toss the pasta again to serve.I also added in a little crushed red chilis...and I used gasp! Parm from a can. I know, I know. I was broke, remember! out of fresh. 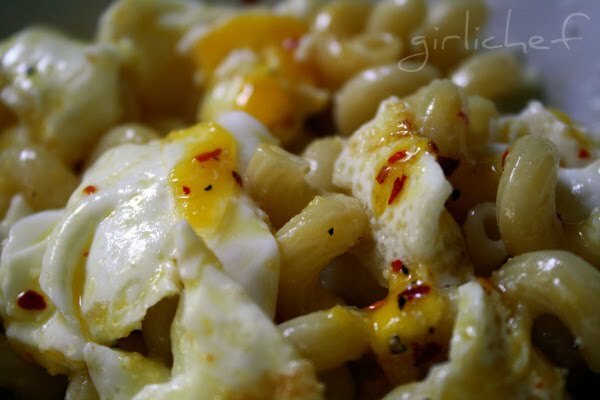 So good and so simple...love that warm, oozing yolk coating the pasta just so! Boil salted water for pasta and cook it; meanwhile, in a tablespoon or so of olive oil, sear a couple of sliced onions until nicely browned, stirring almost all the time. Splash some balsamic vinegar over all and sprinkle with salt and lots of black pepper; reduce the heat so the mixture thickens into a sauce. Drain the pasta, reserving some of the cooking water; toss the pasta with the onion sauce, adding some of the reserved cooking water; toss the pasta with the onion sauce, adding some of the reserved cooking water as needed to moisten and serve. Parmesan cheese is optional. As if. I used four onions since I was caramelizing...I knew they'd cook down to almost nothing. Sweet nothing. This (well, these) is my entry for this weeks POTLUCK over at IHCC...and I'm also sending it over to Katie of Thyme for Cooking who is hosting Presto Pasta Nights this week. 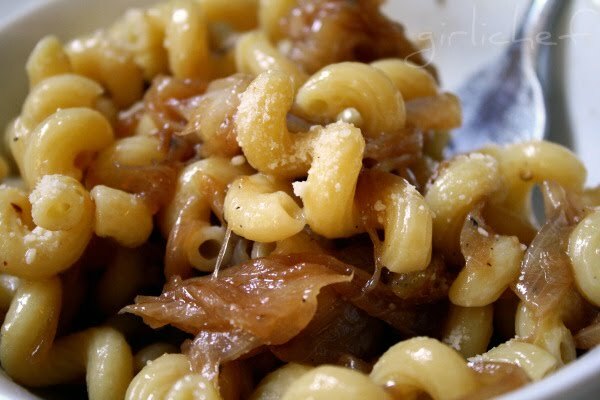 Yes please to the caramelized onions with pasta! There are many many things that are greatly enhanced by runny egg yolk and it had never occurred to me that pasta was one! Genius idea and like all the best foodie ideas so simple! 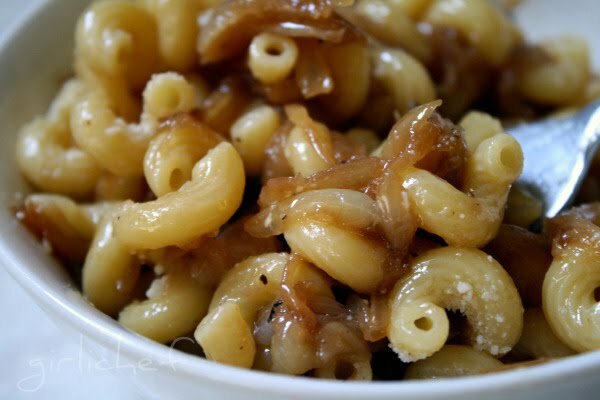 Had pasta with balsamic onions for the first time last night and I am now a fan.